AT&T is offering discounted rates to customers that bring their own phone -- a great opportunity for Google. AT&T (NYSE:T) is following in the steps of T-Mobile (NASDAQ:TMUS) by offering discounted rates to customers who bring their own phone or buy one without the usual subsidy. This is a growing trend in the wireless industry, and one that Google (NASDAQ:GOOGL) may see a benefit from with its low-cost, mid-range Nexus smartphone line. Wireless carriers love smartphone subscribers -- they pay much more than the average feature phone subscriber. What they don't love is paying the high subsidies to phone manufacturers. With each big phone release, wireless carriers like AT&T take an earnings hit as they pay out millions of subsidies to new phone customers. Of course, subscriber fees eventually make up for the lost profits, but it's quite a bumpy ride for shareholders. 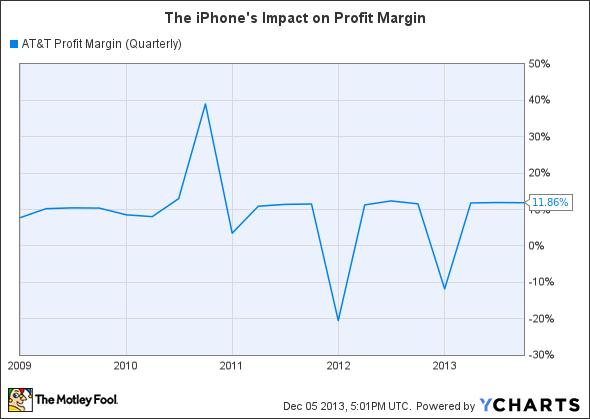 The last two years have seen a correlation between iPhone releases and a drop in fourth quarter net income for AT&T. As you can see, AT&T gets punished when it does a good job and sells a bunch of new phones. Selling too many phones with high subsidies can result in an earnings miss, which, regardless of the reason, never looks good. T-Mobile recognized the business opportunity of no-subsidy, no-contract phones early, and switched its model to focus on the area earlier this year. So far, this plan has resonated with customers, and the company expects to add 1.6 million to 1.8 million net new postpaid customers in 2013 (well above its previous guidance). With T-Mobile's success, it's easy to see more wireless carriers following its lead. Verizon CEO Lowell McAdam indicated earlier this year that he'd keep an eye on the popularity of T-Mobile's new plan, and implenting a similar no-contract service would be "pretty easy." With a growing shift of carriers separating out full phone costs from monthly phone bills, customers will likely pay more attention to the actual price of a new phone (versus the subsidized price). This may be a boon to less-expensive Android phones, as Android has been dominant in markets with lower phone subsidies (like China). Google is in a position to facilitate Android phone purchases with its flagship Nexus smartphones and its subsidiary Motorola's new line of Moto phones. The new Nexus 5 is a competitive phone. Priced $300 to $350 less than the iPhone 5s, the Nexus 5 could do very well in a market that emphasizes the full price of a phone. Motorola has two new phones that could do very well with the no-subsidy model: the Moto X and the Moto G. The Moto X is a high-end phone, which typically retails for $500, and the Moto G is a low-end phone that is priced at just $179. Motorola announced last week that it would move up the U.S. release date of its Moto G GSM model (which supports AT&T and T-Mobile). Although it's unlikely the move was in conjunction with AT&T's newest offer, it's clear Motorola is targeting the no-subsidy smartphone market with the Moto G.
Google could sit back and reap the benefits of other phone manufacturers using its mobile OS. Those benefits, however, are likely much smaller than if it sells its own phones. First, Google isn't selling these phones at cost. While the exact bill of materials for the Nexus 5 is unknown, it's likely less than the $199 Apple pays per iPhone 5s. So, Google will make a pretty penny on every Nexus 5 it sells. More important, however, is that Google is able to exercise complete control over the Android ecosystem. It can funnel Nexus and Moto users into its products and services more easily, which has become a problem for Google as big manufacturers like Samsung and Amazon fork the Android source code to their benefit. The move by AT&T will help smooth out its earnings results, and could be a boon to Google's value-priced phones. For customers buying a new phone off-contract, the value propositions of the Nexus 5 or Moto G are quite enticing. I expect stronger sales of the Nexus line of phones, and potentially more Google Play revenue as more carriers follow T-Mobile's lead.